Save money and sleep a whole lot better. Disclaimer: The folks at Tuft & Needle very kindly provided a mattress for this review. As always, the opinions are my own. I was sleeping in the dip. If you’ve owned a spring mattress for more than a few years, you probably know what I’m talking about. We received a gently used mattress when we got married 10 years ago, and after years of sleeping in the exact same spot every night, the drip had finally become prominent enough to notice. I’d wake up randomly through the night with back aches, and Lauren would regularly roll into my little ditch by accident (not that I complained about that…). After years of putting it off to spend the money elsewhere, we decided it was finally time to invest in something different. Man-oh-man do I hate shopping for a mattress. It’s nearly impossible to accurately describe what you’re looking for to a salesperson, and nothing is less fun than awkwardly laying in the fetal position in front of strangers while your kids roam the store screaming. Even if you find a mattress you like, how can you tell if it’s the right price or support you need based off of 5 minutes in a high stress environment? For that reason, we were really intrigued by many of the mattress startups that have shown up online over the last year or so. Foam mattresses weren’t something we were initially considering (they’re frequently way too soft for my tastes), but companies like Casper, Leesa, and Tuft & Needle seemed to offer a lot of innovation in the space. After doing weeks of research, Tuft & Needle quickly rose to the top of the pack. Their mattresses have superior reviews by a large margin (Consumer Reports even ranks it #3, ahead of 37 other foam mattresses, including Temperpedic! ), and they recently revamped their product with a proprietary foam that stands out from anything else on the market. In early July, we decided that Tuft & Needle would be our new mattress. Tuft & Needle is an inexpensive, foam-based mattress that claims to cut out the middleman and markup in exchange for a great product at a fair price. 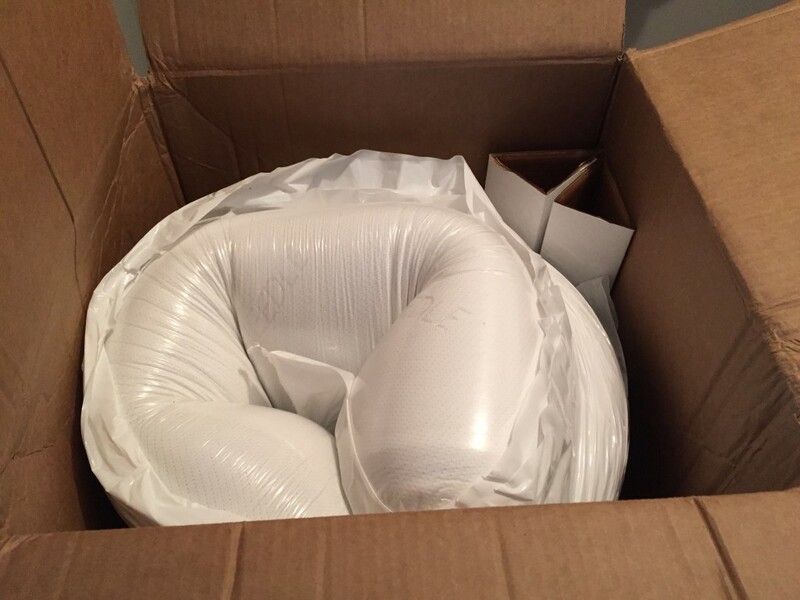 Unlike most other mattresses, they ship compressed in a reasonably sized box and deliver to your house for free (much like you would receive a box from Amazon). Those claims sound great, but that’s a lot of trust to put into a product that you’ll use for 8 hours a day, especially when you haven’t even seen one in person. Is the Tuft & Needle worth considering? Read on to find out. The shopping process at Tuft & Needle is as easy as it gets. Their mattresses are one-model-fits-all, and you simply pick the size you need and complete the check-out process. I ordered mine on a Thursday, and was pleasantly surprised to see a large white box arrive on my front porch less than a week later. Awesome. I’m not going to lie… unboxing the mattress was way more fun than it had any right to be. There’s something magical about a product this size fitting into a box that’s so compact. It reminds me of the novelty towels and t-shirts that sometimes come packaged in an egg or something equally crazy. We drug ours inside, slid the mattress itself out of the box (where it’s wrapped almost like a giant Tootsie Roll), and basically just pushed the giant log up our carpeted stairs. 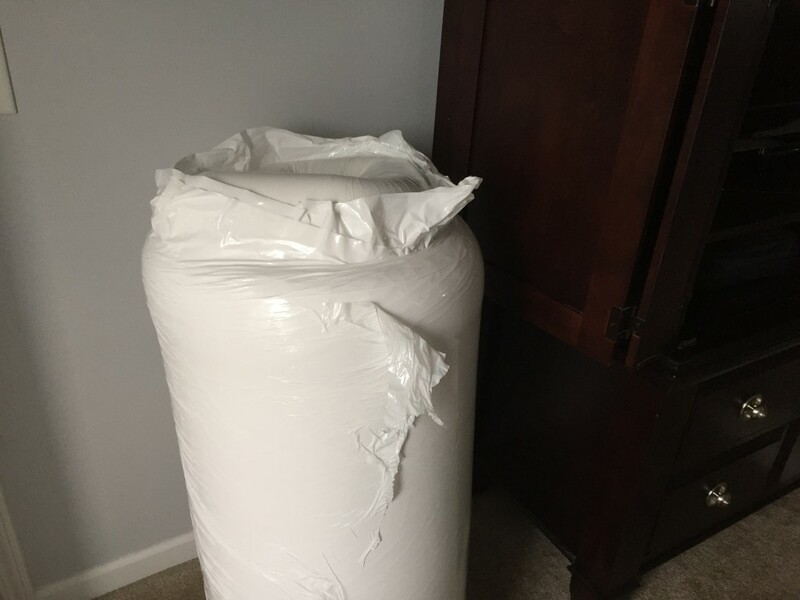 The mattress was surprisingly heavy, but only because it was a giant King-sized mattress compressed into a small roll of plastic. 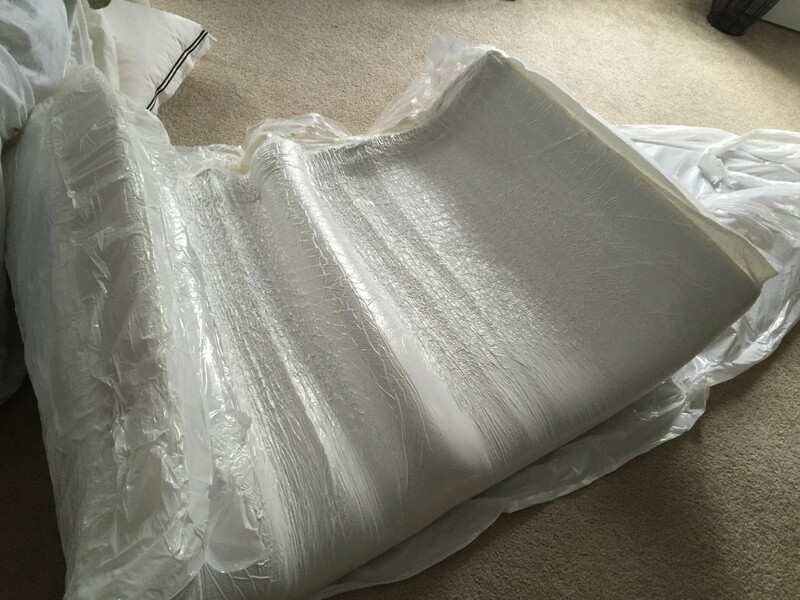 To finish setting it up, we unrolled it from 15ft or so of plastic wrap, where we discovered the mattress was simply flattened and folded in half like a large foam tortilla. We unfolded it, placed it on our bed’s boxsprings (which we only kept around for height), and marveled at how quickly it popped into shape when I opened the final plastic wrapper. 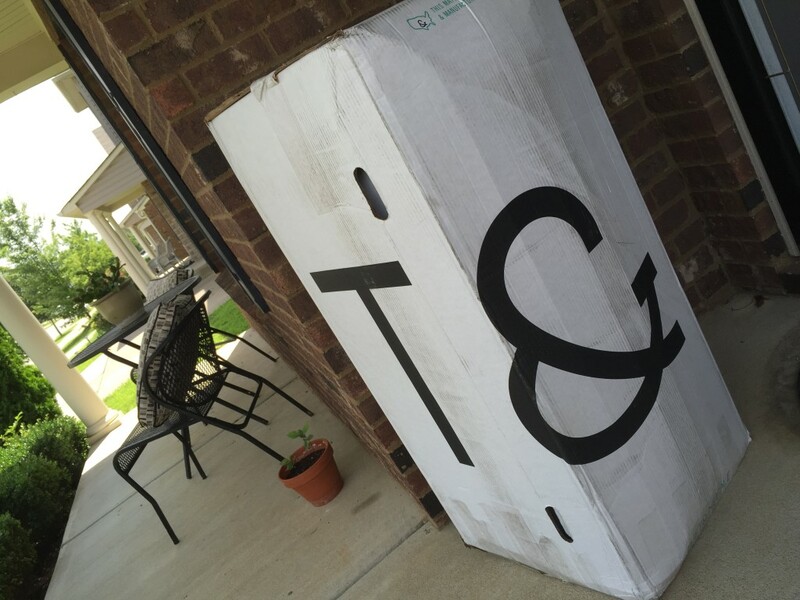 I’ll speak more on the mattress in a second, but the shopping and shipping experience alone was simply phenomenal. The folks at Tuft & Needle have revolutionized a shopping process that’s dreaded by almost everyone; is the mattress itself up to the challenge? The Tuft & Needle mattress isn’t something you’ll look at on it’s own very often, but it’s obvious that every part of it has been crafted with an understated elegance and a lot of care. The mattress cover is soft and gently textured, featuring an embossed logo pattern with a two-tone design. 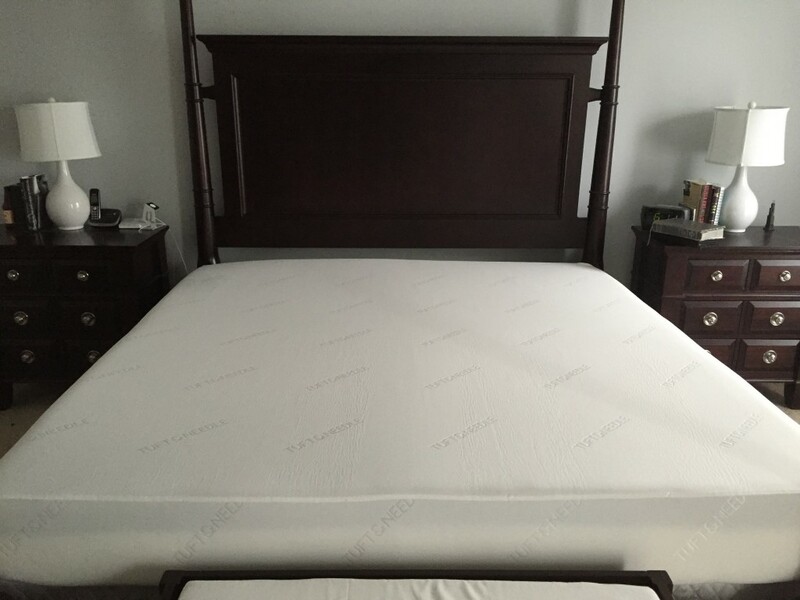 The mattress itself is a deceptively simple two-layer design that combines a 7″ layer of support foam with a 3″ layer of proprietary comfort foam. The latter is the result of a recent redesign, and part of an effort to overcome the problems that are typically associated with foam mattresses. After letting the mattress expand for the recommended 3 hours, I was surprised to find a mattress that is surprisingly supportive, but comfortable in all of the right ways. My 165-lb frame easily sank into our old spring mattress (and way into every memory foam mattress I’ve tried), but the Tuft & Needle is surprisingly buoyant; most of my body stays right on top, while my heaviest parts sink down maybe a half-inch or so. The feeling is kind of difficult to describe, but the “7/10 firmness” description I’ve seen floating around out there for this mattress is pretty accurate by my estimation. I definitely wouldn’t want to sleep on anything softer. One important thing to note is that it’s a touch shorter than the spring mattress we replaced. I don’t know if they create sheets specifically for 10″ mattresses (vs the usual 12″), but we’ve noticed that our fitted sheets seem a little looser than before. It’s hard to write accurately in this section since mattress comfort is so subjective. Overall, the mattress seems to sleep very well. It took us a few days to get used to it since it feels different than our familiar old spring mattress, but we’ve continued to sleep better on it as the days have rolled on. Lauren says her arms no longer ache when she sleeps on her side, and I feel like my body is much better supported due to the way that the foam dynamically adapts to my shape. We’re pretty satisfied. 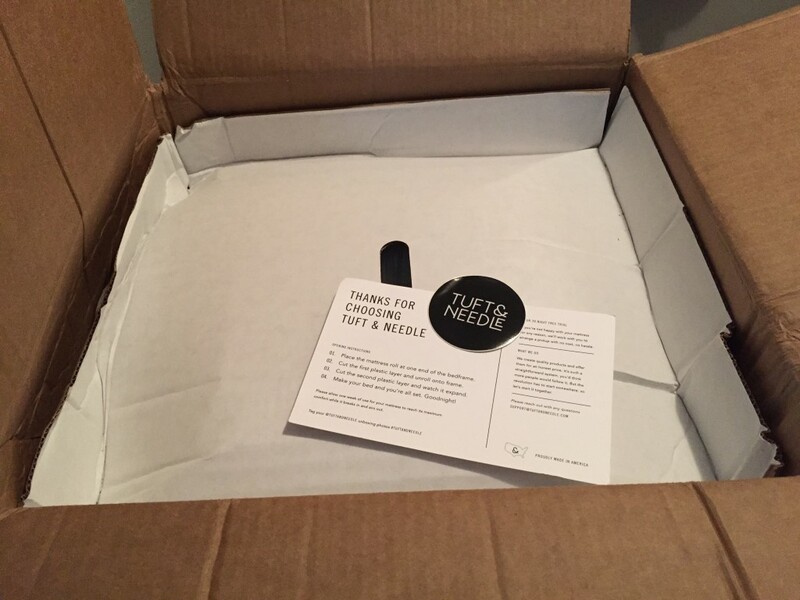 The Tuft & Needle is made in the USA with all American ingredients and a very generous 10-year warranty. From the second we opened the box, it was obvious that this was a quality mattress made by a company with something to prove. We’ve only been sleeping on ours for little over a week, but the foam and cover feel so well-made that I have no doubts about its ability to hold up over the years. It’s scary to make a major personal purchase on something like a mattress, especially when you’ve never even seen one in person. The folks at Tuft & Needle know this, which is why they offer a 100 night, no stress trial. If you don’t like it, just return it; in fact, they don’t even take it back… they donate all returns to charity! If you decide to keep it (and I’m pretty sure you will), the price is simply unbelievable. Our enormous King-sized mattress retails for $750 shipped, which is almost a quarter of what the big-box stores want to charge these days. It’s rare to find a product that both outprices and outperforms the competition, but Tuft & Needle fits the bill. 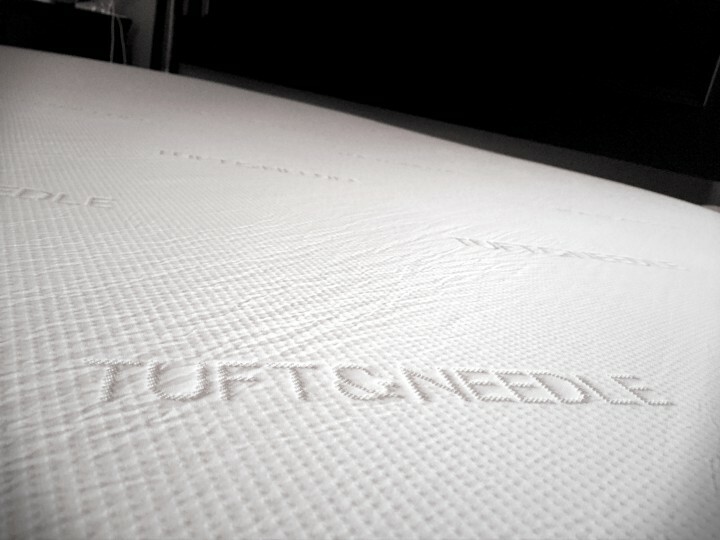 We absolutely love our Tuft & Needle, and recommend it to anyone looking for a mattress. We liked it so much in fact that we immediately purchased another one for our guest room! Between the unbelievable cost and the unmatched comfort, the Tuft & Needle is the easiest upgrade you could make to your bedroom. Unless you have unusually picky mattress requirements, you'd be hard-pressed to find a better mattress solution than the Tuft & Needle. It's easy to buy, extremely comfortable, and more affordable than just about anything else on the market. Thanks for the review. Now that it’s been several months since you got it, do you feel the same way about it? I’m also curious if you still are using this mattress and how it is holding up. I am known to add a trench into any mattress, including the one we have now (not even a year old!) and trying to convince my husband to look at alternatives, such as Tuft & Needle. It’s still a wonderful mattress; we’re both average sized people, but so far it’s keeping its structure fine. I think they even warranty against trenches and stuff.